In chess, there is nothing more fascinating than a master playing blindfold. The following game exhibits the genius of Alexander Alekhine. Much better is 4...exd5 in order to control the central squares. This move creates a weakness at the e5 square. White would exploit this weakness to maximum advantage. A surprising yet powerful move! 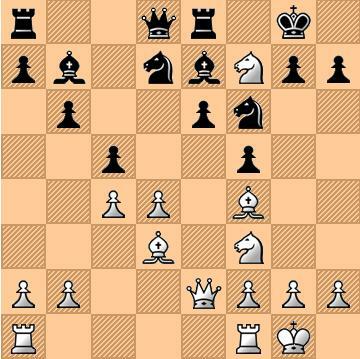 Black has no choice but to capture, as his Queen and e6 pawn are threatened. Another surprise! The Queen cannot be captured because of Ng5 mate. If 16....Kf8 then 17. Ng5 threatening mate at f7. Before making his next move, Alekhine announced a mate in two. This move is better than 17. Nh4+ Kh5, 18. Qxf5+ Kxh4, 19. g3 mate. Preventing 18. Bxf5 mate, but this does not prevent White's next and last move. Good playing! Will have to use your own weapons against you. Thanks Christian. I bet you will.